We wanted to take a moment to highlight a flower that is not only beautiful in gardens but also beautiful in bridal arrangements! For incredible texture and color Hyacinth is the perfect Spring Flower. Although their stem length is not very long (on average around 10 inches long–bloom included), they can be easily incorporated into any tall arrangement with the help of a pick and floral wire! FiftyFlowers offers Grape Hyacinth (Muscari) and Standard varieties both just as beautiful, which you’ll see examples of below. But first, check out their bloom process! You may know Grape Hyacinth as Muscari (or vice versa). These two names are often interchangeable among floral professionals. However, most know them as Grape Hyacinth which is very fitting name since the blooms resemble a grape-like appearance. These flowers are known for their stunning shades of blue! Add a couple stems into your arrangement for a touch of your “something blue.” As you can see in the photos below, they make the cutest boutonnieres! FiftyFlowers offers standard Hyacinths in an array of colors, including a beautiful farm mix pack. These fragrant flowers have multiple star-shaped blooms, delicately clustered toward the top of each stem.You can also remove some of the tiny blooms from the stalk and create a wire “stem” to use them on their own (which you can see in the row of boutonnieres below). Hyacinth would be gorgeous on its own or in a mixed arrangement, which you can see from these inspiration photos! Looking for more Spring #wedding inspiration? Check out our Flower Stories section (you can sort by season at the top!) or head over to our Spring Weddings Pinterest board! Before diving into the flowers you will need to make your #wedding bouquet consider this: what type of bouquet shape do you want? If you’re are not sure check out our Flower Bouquet Shapes and Styles blog post for inspiration. After you decide on the look and style, you can then focus on the types of flowers you will need to make your once in a lifetime flower accessory. To make any arrangement you will need a focal, filler, and line flowers with greenery that will blend naturally. This romantic cascading bouquet showcases all of the elements I listed above! Here’s what I’d suggest to recreate this look: White Designer Lisianthus Flowers, Veronica Flower Light Pink, Creamy Pink Astilbe Flower, Scabiosa Pods, Silver Dollar Eucalyptus, and Fresh Cut Rose Blushing Bride. A very simple but stunning scheme in whites and blues at the beautiful barn at Bury Court, here are Carol’s #wedding flowers. 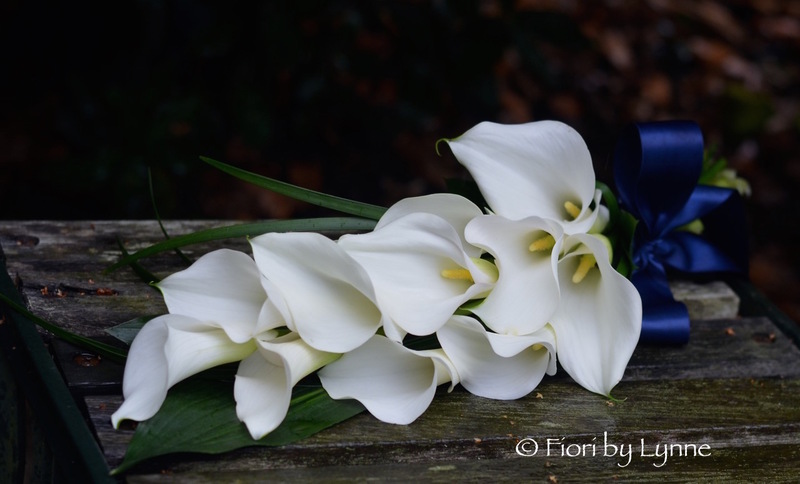 Carol’s bouquet, a simple,elegant overarm bouquet of white calla lilies with a little grass finished with a navy ribbon bow and trails. 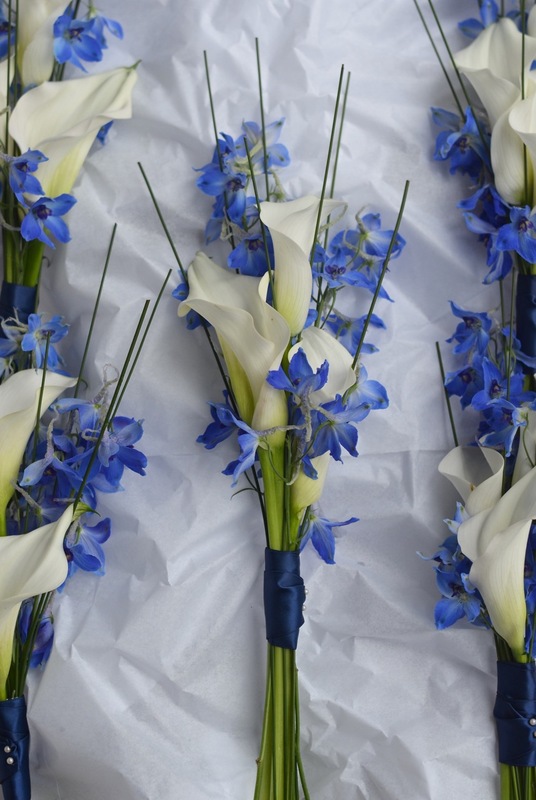 Bridesmaids’ posies of white calla lilies and blue delphiniums with a little grass in a simple, elegant upright design for something just a little different. Stunning, tall centrepiece using blue delphiniums and white gladioli in a trumpet vase, perfect for the barn setting at Bury Court. 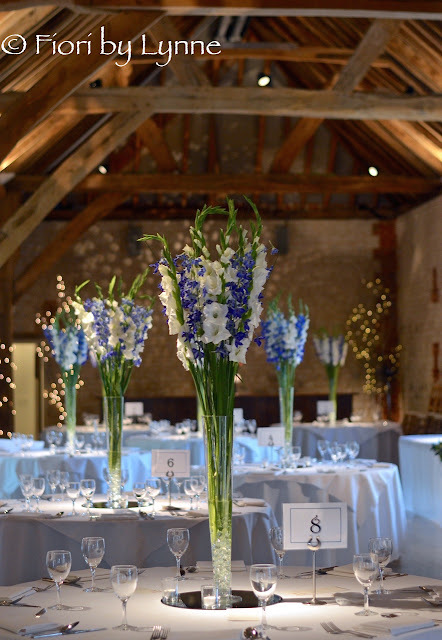 The barn at Bury Court with tall centrepieces of blue delphiniums and white gladioli in elegant trumpet vases. With flowers this beautiful there is no need for anything complicated. 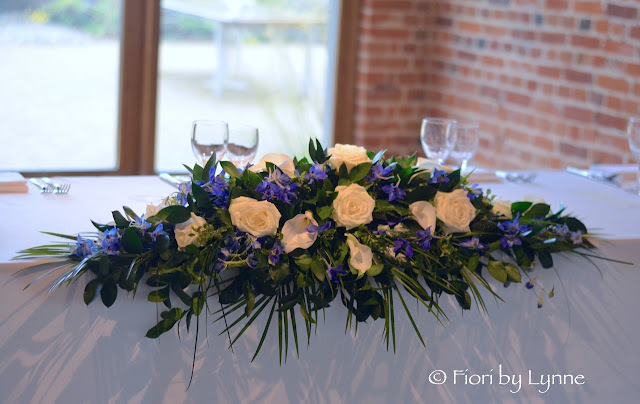 Traditional long and low design for the top table using white roses and calla lilies with blue delphiniums, palm leaf and grasses. 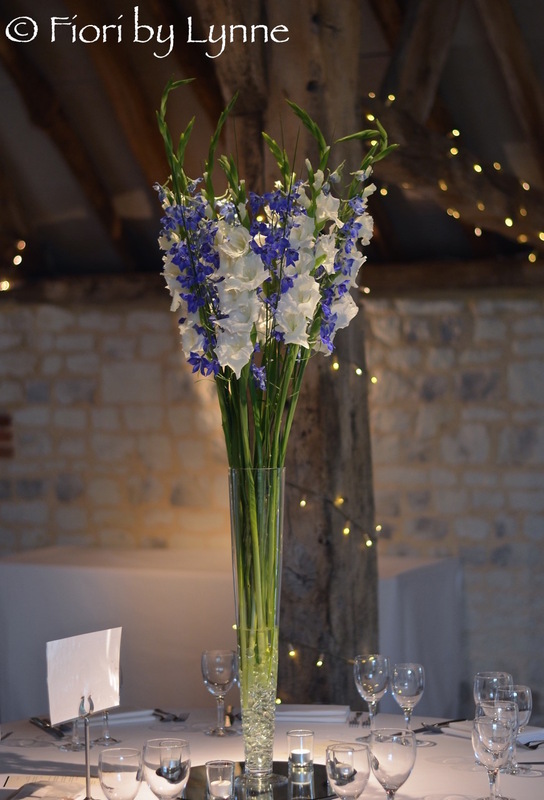 And that just leaves me to say thank you so much Carol for asking me to design and create your wedding flowers for you, it was an absolute pleasure working on this very lovely scheme for you. Wholesale flowers ordered: Natural Blue Thistle (50 stems), Red Ranunculus (100 stems), Burgundy Berry Dahlias (75 stems), Tropical Protea (20 stems), White Peonies for December (50 stems), Privett Berries (5 bunches), Red Ilex Berry Branches (12 bunches of Medium Branches), Olive Branches (10 bunches), Mandarin Bliss Double Tulips (100 stems), and True Blue Eucalyptus (5 bunches). What they created: 1 bridal bouquet, 12 bridesmaids’ bouquets, 12 boutonnieres, and 20 centerpieces! To see Sallie’s flower ratings, comments about her flowers, and even more beautiful photos, click here! that greets you as you get off the elevator! with friends and co-workers after work. This entry was posted in wedding-flowers and tagged - feedly wedding flowers, 59b2bf, wedding. Nothing feels better than coming home after a long day at work and be greeted with a lovely scent. If your scent also looks appealing and adds to your home’s décor, then you are in for a treat. One of the best ways of adding this beautiful touch to your home is with flowers. But while you might not be able to enjoy fresh flowers every day of the week, a potpourri can add just the right scent with a beautiful decorative element. What’s best – you don’t even need to buy the potpourri, but you can make your own potpourri at home! If you’ve never encountered potpourri, let’s clear up what this fantastic thing is all about. Potpourri is essentially “a mixture of dried petals and spices placed in a bowl to perfume a room”. Potpourris come in all shapes and sizes! You can add potpourri on a large vase or fill small candleholders with your chosen mixture. Even the scent itself can be a combination of things. You have seasonal fragrances such as cinnamon and gloves available, or your potpourri could have a fresh, spring scent to it with mint and lemon as the main fragrances. Why Should I Make My Own Potpourri? Potpourri has two obvious benefits: it adds a nice scent to your room and the dried leaf mixture looks like a decorative element when placed in pretty bowls and vases. There’s more to potpourri though. Since you are using natural dried ingredients, you aren’t adding harmful or irritating chemicals to your home. It can therefore be a much safer option to some home fragrances you buy from the stores. Not to mention creating your own potpourri can cost a fraction of home scents like candles and filters! You can find cheap ingredients from flower shops on the VoucherBin.co.uk platform and create a large mixture with just a few pounds. First, you need to select the fragrances you want to use. This means selecting your floral petals, such as roses, mints, rudbeckia and so on. You can also include essential oils to your potpourri, if you want more depth to your scent. Once you’ve picked the petals, you must dry them. The process is easy. Place your petals on a tray covered with paper towels. Place the tray somewhere warm and airy (avoid rooms that are too hot or moist). Turn the blossoms around every day and once they are dried, store in closed containers away from light. You know your petals are dry when they become bristle and feel like they are ready to crumble. Second, you want to create a mixture with your essential oils. It’s a good idea to use two separate scents and to mix them together in a small jar. Keep the mixture in the jar overnight and test the next day to see whether you like the smell. A combination of geranium oil, lemon oil and patchouli oil works well. Third step is about mixing your potpourri. In order to create a coherent and beautiful mixture, you’ll need a third ingredient, which is referred to as the fixative. The fixative could be orris or calamus root, for instance. Place the chosen fixative in a glass container, add your chosen oils and stir the mixture together. Once you are happy with the scent, add the dried petals, carefully stirring it all together. Seal the jar and let it set in a cool and dark place for several weeks. To ensure the mixture is properly mixed, shake the jar every few days. The final step is all about using your potpourri. The mixture should be ready to be displayed in four to six weeks from mixing. You can place it in your chosen bowls or vases for display. If you want, potpourri makes a great gift as well! Follow the above instructions when combining the above ingredients together. Hopefully, the above tips will inspire you to give a go at this fantastic home décor idea. As mentioned above, potpourri also makes a fantastic gift for weddings and Christmas. You can find satchels to pour to potpourri in and give to your friends and family – they are sure to love it as much as you do! This entry was posted in wedding-flowers and tagged - feedly wedding flowers. Is there anything lovelier than a cloud of peonies? Well now, thanks to Sara Logan Photography, Stephanie Scholl Events and Serendipity Designs, you can create a gorgeous bouquet with this step-by-step how-to. With fluffy, sweet peonies and a variety of foraged greenery, this bouquet is perfect your big day or just because. Seasonal and easily attainable greens: foraged blueberry stems, baby peach branches, bay leaves, and gardenia leaves provide the perfect accent for a summer bouquet! Plan on a total of 8-10 stems. Clean all stems of leaves and foliage about 3/4 of the way up, cut at an angle, and place in fresh water. Begin with 1 gorgeous peony and then add some greens, alternating with a gardenia, blueberry, or bay leaf stem. Once the bouquet reaches a desirable size, step back and “fluff.” Pull a couple blooms out a little or tuck some blooms lower to create a bit of depth and interest. Now is the time to pop in a baby peach branch to create a lovely focal accent. Add a couple more greenery stems to create more of a wild or garden look. Once your bouquet or arrangement looks just delightful, tie off with a chenille stem or pipe cleaner, twisting gently around the stems. Don’t lose the all the movement and dancing of the flowers! Cut stems to all be the same length. Then wrap stems with floral tape to ensure everything is held together and no wires poke out. Now either place your gorgeous arrangement in a vase for display, or for a bouquet, simply tie on some lovely ribbons. No wrapping is necessary; a simple bow will do! This entry was posted in wedding-flowers and tagged - feedly wedding flowers, 454473, 454476, 454479, 454482, 454485, 454488, 454491, 454494, 454497, 454500, wedding. We recently provided flowers for a DIY table runner that the Wedding Chicks were putting together for their first ever Facebook Live video, and wanted to share the beautiful results! They were going for an ombre color scheme with bold pink, orange, and red fading to an ivory/white hue, so to achieve this we sent them a pack of Assorted Ranunculus (they received red, yellow, apricot, and orange), Creamy White Dahlia-Style Cremons, and our Whimsical Garden Rose Sample Pack (with Powder Pink, Sherbet Orange, Miso Pretty, and Berry Lace). Check out the results below, and scroll on for their step-by-step instructions! Step 1: carefully cut each flower bud off it’s stem and arrange the flowers on the poster board. Step 2: Once arranged, hot glue each flower to the poster board. This project took two of us about an hour to complete. We recommend being very careful while hot gluing the flowers as burns can and did happen. If you love this DIY project then be sure to check out even more fun do it yourself ideas for your big day by clicking here! Happy Friday Guys….thanks so much for stopping by the cafe this week…sending you lots of hugs and pretty flowers…enjoy your weekend….xoxo Captured by Serena of Love by Serena! This entry was posted in wedding-flowers and tagged - feedly wedding flowers, 59b2bf.